Introduction: Nature has bestowed a very rich botanical wealth. Antimicrobial agents of plant origin have enormous therapeutic potential. Azadirachta Indica (AI) & Aloe Barbadensis (AB) are the natural product that has gained interest in endodontics as irrigant due to their antibacterial effectiveness against several endodontic pathogens. Hence the purpose of this in vivo study was to compare the antimicrobial efficacy of herbal (Azadirachta Indica & Aloe Barbadensis) with conventional (Sodium Hypochlorite and Chlorhexidine Gluconate) irrigants in infected root canals. Methodology: One hundred and twenty five patients satisfying the inclusion criteria were selected. Before and after the root canal preparation, two canal samples were obtained by a harvesting method using a sterile paper point and then transferred for microbiological study. 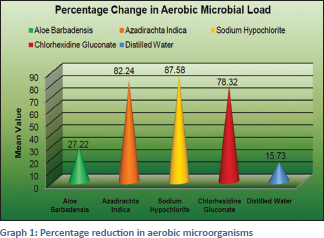 Results: The results of present study indicated that use of Sodium Hypochlorite showed greatest percentage reduction in Aerobic Microbial Load (87.58%) followed by Azadirachta Indica (82.24%), Chlorhexidine Gluconate (78.32%), Aloe Barbadensis (27.22%) and Distilled Water (15.73%). 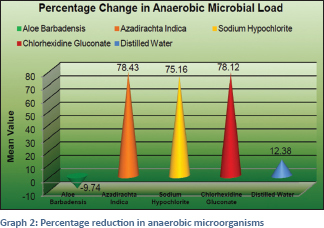 In anaerobic microbial load Azadirachta Indica showed greatest percentage reduction (78.43%) followed by Chlorhexidine Gluconate (78.12%), Sodium Hypochlorite (75.16%), Distilled Water (12.38%) and Aloe Barbadensis (-9.74%). Conclusion: The results of present study indicate that the number of post-irrigant positive cultures (CFU/ml) was significantly lower than the pre-irrigant cultures in all the groups. It is a well-known fact that the presence of microorganisms is the main reason for the dental problems such as caries, reversible pulpitis, irreversible pulpitis, pulpal necrosis, periapical inflammation, and root canal failures. Antimicrobial agents play an important role in controlling these conditions. However, because of the increased bacterial resistance to antibiotics, there is a continuous need for alternative therapies which are affordable, nontoxic, and effective, such as Botanicals alternative medicine which is commonly included in therapeutic and diagnostic disciplines outside the conventional health system. Mechanical instrumentation alone does not result in a bacteria-free root canal system considering the complex anatomy of the root canal system. Therefore, successful root canal treatment is mostly dependent on the removal of these microorganisms through chemo-mechanical instrumentation in which the shaping phase enhances the action of intracanal medicaments and permits better adaptation of filling materials. At present, sodium hypochlorite (NaOCl) appears to be the most effective because it fulfills most of the requirements for an ideal endodontic irrigant. However, unpleasant taste and odor, cytotoxic effect, resorption, inability to remove smear layer, and fully eradicate microbes from the infected canals are the main disadvantages of this popular irrigant. The advantage of using herbal alternatives are easy availability, cost-effectiveness, increased shelf life, low toxicity, and their lack of microbial resistance reported so far. Hence, as we are living in the age of evidence-based medicine, any new concepts and techniques to be used in the clinic should ideally be assessed in randomized controlled clinical trials against their respective gold standards.Hence, the purpose of this in vivo study was to compare the antimicrobial efficacy of herbal (Azadirachta indica [AI] and Aloe barbadensis) with conventional (NaOCl and chlorhexidine gluconate) irrigants in infected root canals. A total of 125 patients were recruited from the regular pool of patients reporting to the Department of Conservative Dentistry and Endodontics. Their age ranged from 18 to 45 years and had no history of systemic diseases. None of the patients were treated with antimicrobial agents at the time of sampling. By following ethical committee recommendations, oral and written informed consent was obtained from all the study participants. Teeth with definite periapical radiolucency were selected and randomly divided into five groups of 25 cases each. The groups were. Group V consisted of 25 patients. In this group, distilled water was used as a root canal irrigant solution (control group). During biomechanical preparation, canal was irrigated with the irrigant (depending on each group) using a sterile syringe with side vented needle that was not allowed to bind to the canal walls. The canal was then dried with a sterile paper point. Following this, one more reading was taken for culture in an identical manner to preirrigant culture method. This constitutes the “postirrigant culture.” The samples were then transferred to Guru Gobind Singh Medical College and Hospital, Faridkot, for microbiological study. Each screw capped vial was shaken to disperse the sample content evenly. The inoculum was taken from the inoculated thioglycollate Broth (HIMEDIA, Mumbai, Maharashtra, India) and inoculated on two blood agar plates, one plate for aerobic and another one for anaerobic bacteria culture using a calibration loop of 3.26 mm diameter that holds 0.004 mL of broth and incubated for 24 h (aerobic) and 48 h (anaerobic). The plates for anaerobic bacteria culturing were placed in the anaerobic chamber with Gas-pak System (HIMEDIA, Mumbai, Maharashtra, India). Numbers of bacterial colonies were counted using a digital colony counter, and the total bacterial count was calculated by multiplying the number of colonies with the dilution factor. The results of the present study were tabulated and subjected to statistical analysis. The comparisons between different groups and subgroups were made using the Nonparametric Kruskal–Wallis, Wilcoxon signed-rank test, and “Mann–Whitney U-test.” The level of significance used was P < 0.05. When the values of Group I (A. barbadensis) were compared with the Groups II-IV for their antimicrobial efficacy against aerobic [Table 1] as well as for anaerobic microbial Load [Table 2], there was statistically significant difference in preirrigation and postirrigation samples. It showed that AI (Group II), NaOCl (Group III), and chlorhexidine gluconate (Group IV), were better than A. barbadensis (Group I) but, when A. barbadensis (Group I) and V (distilled water) were compared for their efficacy, the results were not significant. When the values of AI (Group II) and NaOCl (Group III) were compared against aerobic [Table 1] and [Graph 1] as well as for anaerobic microbial load [Table 2] and [Graph 2], the results were statistically not significant. It showed that both groups were equivalent in their efficacy. When the values of AI(Group II) and chlorhexidine gluconate (Group IV) were compared for their effect on microbial load [Graph 1] and [Graph 2] and [Table 1] and [Table 2], the results were significant. It showed that AIwas better than chlorhexidine gluconate against aerobic as well as for anaerobic microorganisms. When the NaOCl (Group III) and chlorhexidine gluconate (Group IV) were compared for their antimicrobial efficacy against aerobic microbial load [Graph 1] and [Table 1], there was statistically significant difference in postirrigation samples. The percentage change of P value was < 0.001, so the results were highly significant but when both groups were compared for their effect on anaerobic microorganisms [Table 2] and [Graph 2], there was statistically no significant change in preirrigation samples, but postirrigation samples showed highly significant change. Results showed that the antimicrobial efficacy of chlorhexidine gluconate was better than NaOCl against anaerobic microorganisms. The goal of clinical treatment is to completely disrupt and destroy the bacteria involved in the endodontic infection. Peter et al. concluded that 35% of the root canal surface remained uninstrumented even after the use of nickel-titanium rotary instrumentation. Therefore, the combination of chemomechanical preparation is essential to effectively clean the root canal system. The most common endodontic irrigation solution is NaOCl and is the gold standard. NaOCl was first recommended as an antiseptic solution by Henry Dakin around 1915. NaOCl used in various concentrations of 0.5%–5.25% and it can dissolve organic pulpal debris in areas not reached by endodontic instruments.,, At high concentration, NaOCl is toxic, and it can cause inflammation in the periapical tissues, whereas in low concentrations, it is ineffective against specific microorganisms. Various other irrigants were used as an alternative to NaOCl. Chlorhexidine gluconate is another commonly used irrigant in endodontics. It is active against Gram-positive and Gram-negative bacteria, facultative anaerobic and aerobic bacteria, spores, viruses, and yeast. At low concentrations, chlorhexidine gluconate is bacteriostatic, and it is bactericidal at higher concentrations. However, the use of chlorhexidine gluconate as an endodontic irrigant is generally restricted because it can discolor teeth and some patients might have side effects such as transient taste disturbances, burning sensation of the tongue, discoloration of the tongue, and composite restorations. Because of the toxicity and developing resistance of root canal bacteria to the conventional root canal irrigants, the new era shifted toward the natural medicaments as root canal irrigants both by the endodontists and the patients. In this study, A. barbadensis and AI were used as irrigant because of their antimicrobial properties and easy availability. A. barbadensis (Aloe vera) consists of active ingredients such as curcumin, nimbidin, myristic acid, tannins, and anthraquinones, respectively, which have been reported to exert antimicrobial, anti-inflammatory, and antioxidant properties. It has been proven that A. vera shows considerable antimicrobial activity against various species such as Streptococcus pyogen, Enterococcus faecalis, Candida albicans, and Staphylococcus aureus. Azadirachta Indica (AI), popularly known as Indian Neem (Margosa Tree) or Indian lilac. In Sanskrit, it is called “arishtha” meaning “reliever of sickness.” Use of AI as an endodontic irrigant might be advantageous because it is a biocompatible antioxidant and thus not likely to cause the severe injuries to patients that might occur via NaOCl accidents. Bitter taste associated with this plant can be altered by addition of sweeteners and flavors to increase the patient's compliance and acceptability. Chopra et al. stated that AI/neem leaves, seeds, and bark possess a wide spectrum of antibacterial action against Gram-negative and Gram-positive microorganisms, including Mycobacterium tuberculosis andstreptomycin resistant strains. Another study done by Satyavati et al. showed that AI inhibits Vibrio cholerae, Klebsiella pneumoniae, M. tuberculosis, and S. pyogenes. Antimicrobial effects of neem extract also have been demonstrated against Streptococcus mutans and Streptococcus faecalis by Almas. According to the results of the present study when the values of AI and NaOCl were compared for their effect on aerobic microbial load, they showed statistically no significant difference. The findings of our present study were in concurrence with the in vitro study carried out by Bhargava et al. In their study, they concluded that neem is an effective as NaOCl against endodontic microflora. The possible reason might be that the AI has antibacterial, antifungal, antiviral, antioxidant, anti-inflammatory, antipyretic and analgesic properties. These properties were due to the presence of several active constituents such as nimbidin, nimbin, nimbolide, gedunin, azadirachtin, mahmoodin, margolone and cyclictrisulfide. Another factor for its activity was studied by Baswa et al., who found that it can cause inhibition of cell membrane synthesis. When the values of AI were compared with NaOCl for their effect on anaerobic microbial load, they showed AI was better than NaOCl but, it was statistically nonsignificant. The reason could be gallotannin component of the neem extracts. Wolinsky et al. demonstrated that gallotannin component had an inhibitory effect on insoluble glucan production and bacterial aggregation. When the values of AI were compared with chlorhexidine gluconate for their effect on anaerobic microbial load, AI showed better results than chlorhexidine gluconate which was statistically significant. The findings of our present study were in concurrence with the in vivo study carried out by Singhal et al. According to the results of the present study, A. barbadensis is not recommended as a root canal irrigator because it had showed least efficacy against anaerobic microbial load as compared with distilled water. Under the limitations of this study, AI offers maximum antibacterial advantage over NaOCl and chlorhexidine gluconate. It seems like AI is a promising alternative to NaOCl, the current gold standard in irrigation. The results of present study indicate that the number of postirrigant-positive cultures (CFU/mL) was significantly lower than the preirrigant cultures in all the five groups. According to the results of the present study the AI is a promising alternative to NaOCl and chlorhexidine gluconate as irrigant in infected root canals. AI showed statistically significant activity against aerobic and anaerobic microbial load, but further research is needed to conclusively recommend the AI as a root canal irrigant. Long-term clinical trial with larger sample size is required to know the exact behavior of this irrigant on root canal bacteria. There is also a need of more in vivo studies for recommending ideal clinical protocols while using herbal materials as irrigants in root canals. Chandrabhatla SK, Rajasekhar V, Nalam SG, Pandranki J. Natural medicaments in endodontics. J Oral Res Rev 2012;4:25-32. Hess W, Zurchar E, Dolamore WH. Anatomy of Root Canals in the Teeth of the Permanent Dentition. New York: William Wood & Co.; 1925. Peters OA, Barbakow F. Effects of irrigation on debris and smear layer on canal walls prepared by two rotary techniques: A scanning electron microscopic study. J Endod 2000;26:6-10. Torabinejad M, Shabahang S, Aprecio RM, Kettering JD. The antimicrobial effect of MTAD: An in vitro investigation. J Endod 2003;29:400-3. Tanomaru Filho M, Leonardo MR, Silva LA, Aníbal FF, Faccioli LH. Inflammatory response to different endodontic irrigating solutions. Int Endod J 2002;35:735-9. Busslinger A, Sener B, Barbakow F. Effects of sodium hypochlorite on nickel-titanium lightspeed instruments. Int Endod J 1998;31:290-4. Shuping GB, Orstavik D, Sigurdsson A, Trope M. Reduction of intracanal bacteria using nickel-titanium rotary instrumentation and various medications. J Endod 2000;26:751-5. Moller AJ, Microbiological examinations of root canals and periapical tissues of human teeth. Methodological studies. Odontol T 1966 ;74:Suppl:1-380. Baumgartner JC, Ibay AC. The chemical reactions of irrigants used for root canal debridement. J Endod 1987;13:47-51. Baumgartner JC, Cuenin PR. Efficacy of several concentrations of sodium hypochlorite for root canal irrigation. J Endod 1992;18:605-12. Senia ES, Marshall FJ, Rosen S. The solvent action of sodium hypochlorite on pulp tissue of extracted teeth. Oral Surg Oral Med Oral Pathol 1971;31:96-103. Jeansonne MJ, White RR. A comparison of 2.0% chlorhexidine gluconate and 5.25% sodium hypochlorite as antimicrobial endodontic irrigants. J Endod 1994;20:276-8. Kuruvilla JR, Kamath MP. Antimicrobial activity of 2.5% sodium hypochlorite and 0.2% chlorhexidine gluconate separately and combined, as endodontic irrigants. J Endod 1998;2:4726. Leonardo MR, Tanomaru Filho M, Silva LA, Nelson Filho P, Bonifácio KC, Ito IY, et al. In vivo antimicrobial activity of 2% chlorhexidine used as a root canal irrigating solution. J Endod 1999;25:167-71. Yamashita JC, Filho MT, Leonardo MR, Rossi MA, Silva LA. Scanning electron microscope study of the cleaning ability of chlorhexidine as a root-canal irrigant Int Endod J 2003;36:391-4. Gomes BP, Vianna ME, Zaia AA, Almeida JF, Souza-Filho FJ, Ferraz CC. Chlorhexidine in endodontics. Braz Dent J 2013;24:89-102. Hamman JH. Composition and applications of Aloe vera leaf gel. Molecules 2008;13:1599-616. Chopra IC, Gupta KC, Nazir BN. Preliminary study of antibacterial substances from Melia azidirachta. Indian J Med Res 1952;40:511-5. Satyavati GV, Raina MK & Sharma M. Medicinal plants of India, Vol. 1. New Delhi: Indian Council of Medical Research; 1976. Almas K. The antimicrobial effects of extracts of Azadirachta indica (Neem) and Salvadora persica (Arak) chewing sticks. Indian J Dent Res 1999;10:23-6. Bhargava K, Kumar T, Aggarwal S, Zinzarde S, Sanap A, Patil P. Comparative evaluation of the antimicrobial efficacy of neem, green tea, triphala and sodium hypochlorite: An in vitro study. J Dent Res Rev 2015;2:13-6. Baswa M, Rath CC, Dash SK, Mishra RK. Antibacterial activity of karanj (Pongamia pinnata) and neem (Azadirachta indica) seed oil: A preliminary report. Microbios 2001;105:183-9. Singhal A, Gurtu A, Guha C. Comparison of antimicrobial efficay of conentional irrigants and herbal products, alone and with calcium hydroxide against enterococcus fecails an in vitro study. Guident 2012;1:77-80. Ringel AM, Patterson SP, Newton CW, Miller CH, Mulhem JM.In vitro evaluation of chlorhexidine gluconate solution and sodium hypochlorite solution as root canal irrigants. J Endod 1982;8:200-4. White RR, Hays GL, Janer LR. Residual antimicrobial activity after canal irrigation with chlorhexidine. J Endod 1997;23:229-31. Weber CD, McClanahan SB, Miller GA, Diener-West M, Johnson JD. The effect of passive ultrasonic activation of 2% chlorhexidine or 5.25% sodium hypochlorite irrigant on residual antimicrobial activity in root canals. J Endod 2003;29:562-4.